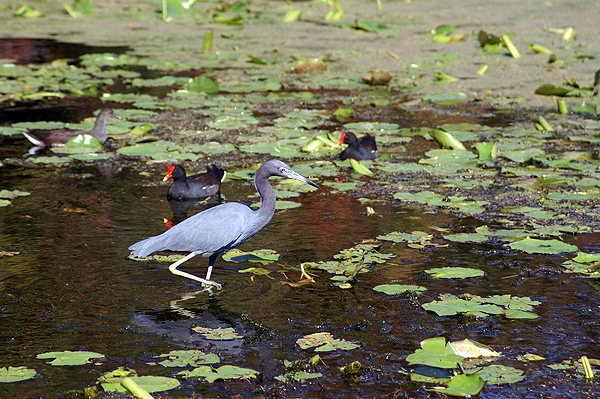 The little blue heron, Egretta caerulea, is looking for lunch, while a pair of common gallinule, Gallinula chloropus, look on. Wakulla Springs State Park protects a huge spring that is the source of the river that these birds are lucky enough to live in. This entry was posted on Friday, July 20th, 2012 at 4:35 am. It is filed under Animals / Wildlife, New Images and tagged with birds, blue, common gallinule, Egretta caerulea, Gallinula chloropus, ittle blue heron, lilies, plants, red, water. You can follow any responses to this entry through the RSS 2.0 feed.